One of my favorites - use it on everything! This is the greatest spice I've found. How can you go wrong when it has a little bit of everything? And I love the five pound bucket. I use this on just about everything. And it makes a terrific marinade when combined with olive oil. Highly recommended! My dad introduced me to Spike back in the '70s. He used it on every kind of meat and eggs, and considered it as basic to seasonings as salt and pepper. 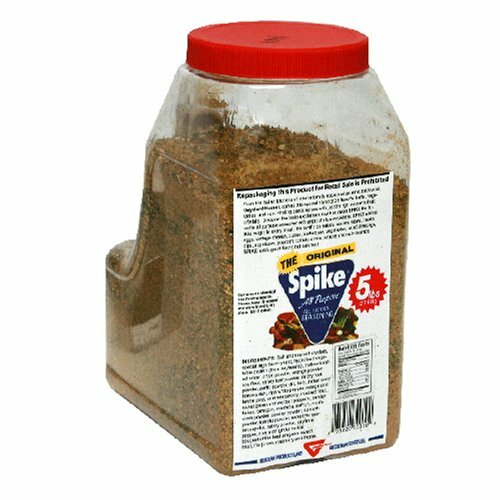 The tradition continues with me, because in all the years that have passed since then, I've never encountered a seasoning as delicious as Spike. I sometimes wonder if the name puts people off, because honestly, I've never known anyone who didn't love it once they've tried it -- and everyone who's ever known me as friend or family has probably received a bottle of it from me at some point. To give you some idea of just how much I love this stuff, when I moved to my current rural location almost five years ago, I discovered to my chagrin that the only supermarket in town didn't carry Spike in their spice section. I promptly requested that the store begin stocking it and, despite some skepticism from the manager, they agreed. Aside from the bottles I've been buying (I personally go through about a bottle per month), I've noticed that they've been having trouble keeping it in stock (i.e., one day I'll see a half-dozen bottles on the shelf, and a few days later, they're all gone -- and it wasn't me who bought them). I've seen it in the 7-ounce boxes before, but never in a FIVE-POUND JUG. Upon seeing that, there was a brief pause to allow myself to recover my jaw from the floor before briskly smacking that 1-Click button. "MUST HAVE" seasoning blend for the gourmet chef. Absolutely the finest seasoning ever concocted. Thank-you Gaylord. My mom turned me on to this decades ago, and my kitchen is never without it. I use it in nearly everything (except fruit and fish).